"All you do is make all your cuttings somewhere around 15-20cm long (I cut the base with a sloping cut behind a bud), remove all their leaves as they harbor lots of fungi etc (you could dip them in some kind of fungicide but I don't tend to bother), bundle them up and wrap them in newspaper, put a rubber band around the top and bottom to keep the whole thing together. Run the newspaper under a tap to moisten it, allow all excess to drip off, then seal it all in a plastic bag and forget it for a while. Some will begin callousing after only a week. When they've started callousing pot them on as you would normal rooted cuttings and keeping them humid until leaves and roots begin to appear. I have a few large clear tubs (about 140 litrres so nearly about 70cm long by 50cm wide and about 40cm tall) that I put a 10cm layer of moist perlite and peat in that I plant the calloused cuttings straight into, put the clear lid on it, put it outside in a shaded position (as the sun will cook them quickly) and they are ready to begin hardening off in just a few more weeks. With my multiflora cuttings I do this except instead of planting them in the tub I stick them straight in the ground after pre-callousing them and they are away in about a week and I tend to do about 50 at a time. I do this at all times of the year and it occurs faster in the warmer months than the cold." The photo illustrates my results with one of the Kim Rupert Gallica hybrids I use in breeding. Cuttings were taken from a fully dormant plant and placed on top of my fridge for about 6 weeks. As you can see these calloused easily and have roots well formed, ready to pot up. I would suggest experimenting to find the ideal stage for potting these up; some varieties might work best if potted before roots formed and others might fare better with roots well on their way. Labels: Hardwood cuttings, propagation, softwood cuttings. At this time of year, few things bring me such intense pleasure as the unfolding of the first new leaves in the greenhouses. (Well, the first Hyacinths in bloom qualify as well) I love the coloring of everything in this photo; soft colors and subtle contrasts. Here we have new foliage on my mature specimen of a Dwarf China sent to me years ago by Sheri Berglund who had collected it as a mystery rose from a California cemetery. It is almost identical in habit to 'Oakington Ruby', another dwarf China from the late 1800's (we think) but with medium Carnation pink blooms. If it weren't for the bloom color these two varieties would be virtually indistinguishable. I wonder if one might be a sport or seedling of the other. We'll likely never know. 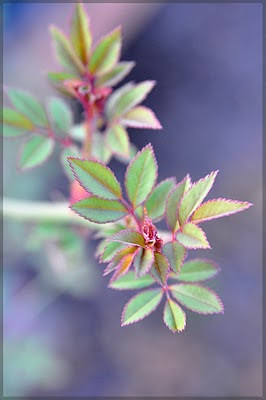 For now, I'm happy just to watch the leaves unfold with their bluish matte surfaces and the reddish tips and petioles. There are a few buds well on their way also, making this a contender for First Rose Of The Spring. Breeding: Ralph S. Moore, 1972. Sister seedling to 'Rise 'N' Shine'. Parentage: 'Little Darling' X 'Yellow Jewel'. A little known tidbit about this plant's history is that it was submitted for the AOE trials and was scheduled to be released as a commercial variety if it won an award. Unfortunately it didn't win an AOE, but it played a far more important role in Moore' breeding program. 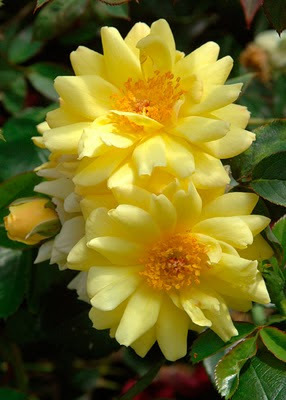 1-72-1 is the parent of many excellent roses, including 'Cal Poly', 'Golden Gardens', 'Joycie', 'Pink Poodle', 'Sequoia Ruby', 'Twister' and 'Work of Art'. 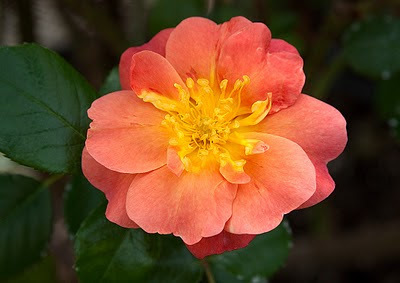 Moore made it known to many of his hybridizer friends that although 'Rise 'N' Shine' has played a role in breeding many excellent roses, 1-72-1 was the better parent. 'Rise 'N' Shine' breeds far too many white and off-white seedlings, whereas 1-72-1 breeds a higher percentage of strong yellows and oranges. 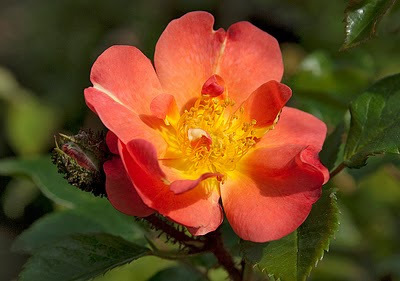 Without 1-72-1 we'd have a significantly less rich gene pool in the yellow color group, and its influence can be traced through many generations of modern roses both large and small. Here's to Ralph Moore on this sunny day, and to the lovely golden 1-72-1! I close my eyes and all I see is seeds and more seeds. 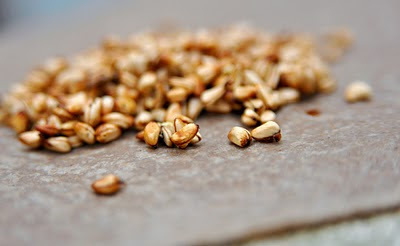 I've been spending several hours a day for two weeks now, cleaning and prepping seeds for sowing. I'm starting to dream about cleaning rose seeds! 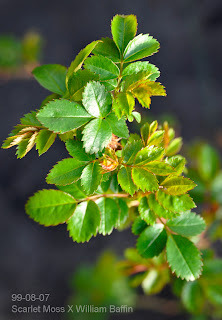 I have a self-seedling from the Hybrid Rugosa 'Schneezwerg' that I have occasionally used in breeding. It is a compact shrubby plant that closely resembles R. rugosa alba, but more shapely and restrained in growth. 'Schneezwerg' is supposedly R. rugosa X R. beggeriana. The seeds pictured here are a cross of the 'Schneezwerg' F2 X Ralph Moore's "Magseed", and so R. rugosa is represented on both sides of the equation. The idea here is to generate a Rugosa-like shrub with large blooms in a red hue, hopefully with improved repeat and some fragrance. As a side note, I sorted several seed lots of various crosses in which 'Schneezwerg' served as the seed parent, and curiously, the seed size varied considerably depending on what the other parent was! The second seed has germinated: 'Golden Angel' X 'Champlain'. This year I started sowing the seeds very early. First was open pollinated seed from 'Magic Wand' and a week later was this cross, 'Golden Angel' X 'Champlain'. 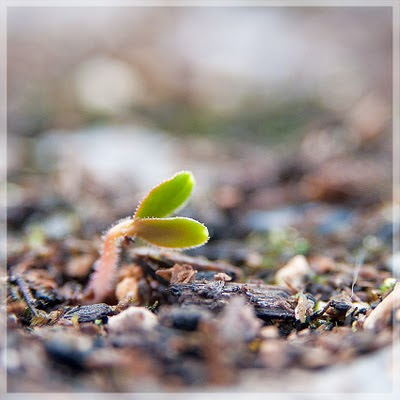 The photo was taken yesterday morning, and by the end of the day two more seedlings were starting to emerge, so undoubtedly many more are on their way. Regarding this cross: I have found that 'Golden Angel' (yellow miniature from the 1970's, by R. S. Moore) is quite malleable in breeding, often taking on characteristics from the other parent, to the point that none of the 'Golden Angel' traits are visually apparent. 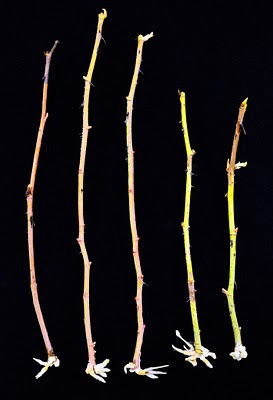 Of course, you do get a fair number of miniatures or dwarf plants, since the miniaturism trait is a dominant, but many are shrubs that show no miniaturization whatsoever. With this in mind, I made this cross using the Canadian hardy shrub 'Champlain' as the pollen parent. The hope is to obtain some very Winter hardy orange-red shrubs that bloom frequently and generously, and have attractive, compact plant architecture. It is also known that 'Golden Angel' can sometimes give highly Blackspot resistant offspring, so in combination with 'Champlain' the odds of achieving this might be improved. The first seedling has lifted its cotyledon's above the soil line: open pollinated seed from 'Magic Wand' (surely a good omen). It has begun!